10 n Performance & Hotrod Business n April 2015 Continental, VDO Launch Free Mobile App Continental Commercial Vehicles & Aftermarket, manufacturer and supplier of ATE and VDO replace- ment parts, now offers a free mobile app that allows easy parts lookup on the ATE-VDO Auto Parts Catalog. Continental developed the application for multiple mobile platforms in partnership with Vertical Development and ShowMeTheParts, according to the company. The new app, which is compatible with Apple iOS and Android mobile devices, allows the user to scan the vehicle's VIN barcode through either the windshield VIN tag or the driver's side doorframe sticker. The VIN scan will identify all of the parts in the ATE-VDO Auto Parts Catalog that are related to that vehicle. The new mobile app can be down- loaded for free from the Apple Store for iOS devices and Google Play for Android devices. Users can quickly and easily search for compatible parts on any car or light truck on the market, the company noted. The catalog's database also contains product information, specifications, instruction sheets, photos, vehicle relearn procedures for TPMS and other details for VDO-brand electric motors, door systems, engine manage- ment, fuel supply, TPMS replacement parts, REDI-Sensor Multi-Application TPMS sensors and ATE brake pads and rotors. In addition to the VIN scan, the new app also allows users to search based on vehicle make and model and cross- reference with the touch of a button. Heatshield Products Celebrates 30 Years Heatshield Products is celebrating 30 years of business in 2015. The company started with two products: Thermal Sleeving and Thermaflect Shield (originally called Heat Blanket), according to an announce- ment. The Heatshield Products line has since grown to more than 400 products that span the automotive, marine, industrial and military markets. "When Mel Heye and his son Bruce started the company, their goal was to engineer and manufacture the most technologically advanced and efficient ther- mal and acoustic shielding products the automotive aftermarket had ever seen," according to the company. From the confines of the family's two-car garage, Heatshield Products has expanded to more than 500 dealers globally. It now encompasses two manufactur- ing facilities with a combined total of 20,000 square feet, with plans to open a third facility later this year. The company is still family-owned, and all of its thermal and acoustic barrier products are still made in the USA. 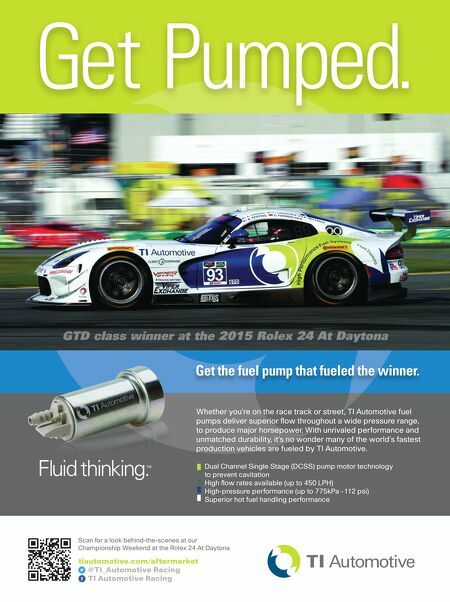 TI Automotive to Sponsor Two TUDOR Vipers TI Automotive, a global supplier of automotive fluid systems technology, will sponsor two Dodge Viper GT3-R race cars in the 2015 TUDOR United SportsCar Championship GTD Class. The season began with the annual Rolex 24 at Daytona on Jan. 24-25. TI Automotive will serve as the primary sponsor on the Riley Motorsports No. 33 and No. 93 in the four long-distance races of the TUDOR series at Daytona, Sebring, Watkins Glen and Road Atlanta, according to the company. The grouping of TUDOR endurance races frames the Patron North American Endurance Cup. For the other remaining races of the TUDOR series, TI Automotive will remain as an associate sponsor of the No. 33 Viper Exchange race car, the company added. 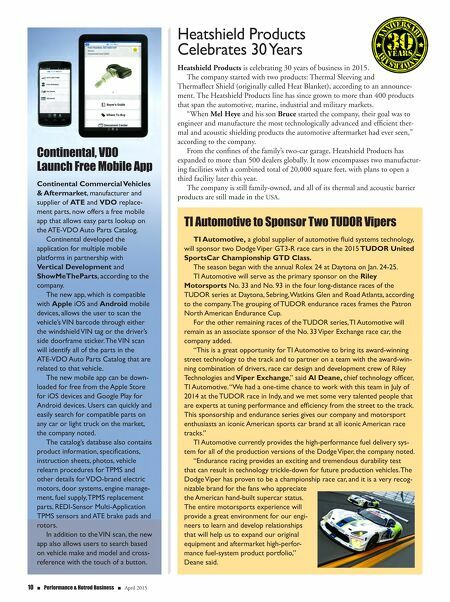 "This is a great opportunity for TI Automotive to bring its award-winning street technology to the track and to partner on a team with the award-win- ning combination of drivers, race car design and development crew of Riley Technologies and Viper Exchange," said Al Deane, chief technology officer, TI Automotive. "We had a one-time chance to work with this team in July of 2014 at the TUDOR race in Indy, and we met some very talented people that are experts at tuning performance and efficiency from the street to the track. This sponsorship and endurance series gives our company and motorsport enthusiasts an iconic American sports car brand at all iconic American race tracks." TI Automotive currently provides the high-performance fuel delivery sys- tem for all of the production versions of the Dodge Viper, the company noted. "Endurance racing provides an exciting and tremendous durability test that can result in technology trickle-down for future production vehicles. The Dodge Viper has proven to be a championship race car, and it is a very recog- nizable brand for the fans who appreciate the American hand-built supercar status. The entire motorsports experience will provide a great environment for our engi- neers to learn and develop relationships that will help us to expand our original equipment and aftermarket high-perfor- mance fuel-system product portfolio," Deane said.